The caterpillar pupates in a cocoon between two joined leaves cut from the foodplant but attached to it with silk. 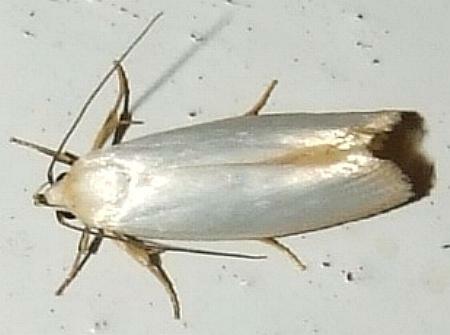 The adult moth has white wings shading to yellow at the edges. The wingspan is about 2 cms. CSIRO Publishing, Melbourne 1994, pp. 24, 29, 95, 96, 202. Series 1, Volume 7, Number 4 (1885), pp. 450-451.